"Neither snow nor rain nor heat nor gloom of night stays these couriers from the swift completion of their appointed rounds." This is the inscription on the U.S. General Post Office building, but replace "couriers" with "golfers" and you have a creed that will motivate you to keep playing in every season. With certain precautions and equipment, you can take on just about any weather conditions. For starters, you may have to modify the way you play in accordance with the cold. Low temperatures can decrease the ball's spin and distance. A softer ball is the best option in this case. The Titleist NXT Tour S Golf Ball solves both of problems because it has a Fusablend cover for excellent softness and a Staggered Wave parting line for improved aerodynamics. The shorter distances mean that you may also have to use a more powerful swing on every approach shot. Using a tee that is one level up from your normal length is a good idea as well. The power of wearing the right clothes should not be underestimated, either. You've been told since you were a kid that it's important to bundle up, but it's just as important to dress in layers. A voluminous down parka doesn't lend itself to movement. A turtleneck or thermal shirt covered by a sweater and a lightweight jacket moves with you while still keeping you warm. You don't want to be too warm, however, as the dampness caused by sweating can make you feel cold, too. The adidas ClimaWarm Rangewear Half-Zip is specifically designed to keep you both warm and dry. Don't forget your head and hands. If anything, having warm hands is the most important part of successful cold-weather golf. 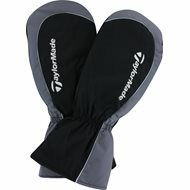 The TaylorMade Cart Mitten Golf Glove is an example of a durable glove that insulates but still allows for flexible movement. As for your head, which is more sensitive to cold than other body parts, a close-fitting beanie or knitted cap is a good option. The Titleist Winter Hat is made to draw away sweat so you can stay warm without feeling too hot. While we're on the subject of sweating, be sure to stay hydrated. You may not feel it, but you're exerting yourself just as much (if not more) as you do when you're playing in warmer conditions. Before you even get to the course, make sure everyone knows the rules of casual water on not only the green, but in the fairways, bunkers, and around the hazards as well. It will save you from getting into arguments later on. You should also keep in mind that the wet ground will be softer, which can increase roll. Soft ground and wet turf call for a durable, waterproof shoe. The FootJoy DryJoys Tour Golf Shoe is an excellent option, but if it's just the spikes you want, Champ Golf Spikes will keep you from sliding in mud. A good grip on your club is just as important as a good grip on the ground. Waterproof, textured gloves like the FootJoy RainGrip Golf Gloves keep your hands secure even when the club and grip are soaked. Wiping down your grips with a towel before each use also cuts down on slippery shots. Of course, this is another instance where your childhood lessons apply: wear a raincoat and carry an umbrella. A typical raincoat probably wouldn't move with you as you swing, but a lightweight golf rain jacket like the FootJoy DryJoys Hydrolite Rain Jacket paired with the FootJoy DryJoys Hydrolite Rain Pants gives you waterproof protection while still letting you move comfortably. A golf umbrella like the Callaway Tour Authentic Umbrella is ideal for protecting the top of your golf bag because unlike a towel, it's waterproof. That's why golf umbrellas have such a large canopy compared to regular umbrellas—to keep yourself and your bag protected from the rain. Obviously, if the rain comes along with thunder and lightning, you should pack up and call it a day. 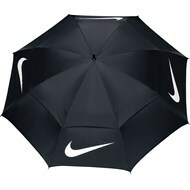 Both umbrellas and also your clubs in the apex of your swing make for great lightning rods, so unless you have a deathwish, it's best to let mother nature win those rounds. Start your round early in the day. The middle of the day is usually when the sun's power and rays are at their peak. And while the sun may not be as bright later in the afternoons, the hottest part of the day (especially in the summer) is in the late afternoon. For protection that goes beyond sunblock, wear UV-protective clothing like the adidas Performance 3 Color Stripe Shirt. A good golf hat not only protects you from UV damage, but it also reduces glare. While a cap like the Titleist Mesh Cap offers UV protection for your whole head, a visor like the TaylorMde High Crown Visor has a more lightweight feel. A sun hat like the Dorfman Pacific Brim Boonie Soaker Hat is breathable and covers the top of your head, yet it may not keep sweat from your face the way a moisture-wicking hat or visor might. Finding the right hat depends on your sensitivity to sunlight, the amount of sweat you normally produce in hot weather and your own sense of style. When it comes to glare reduction, however, a hat can't compete with a quality pair of golf sunglasses. Wraparound lenses have the additional advantage of keeping glare from your peripheral vision. 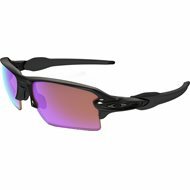 The Oakley Prizm Radar EV Sunglasses are one example. If you need prescription lenses, you may want to try "prescription-ready" sunglasses. These have lenses that you can take out and replace with prescription lenses. Golf can be played year-round if you do it right. Of course, playing in three feet of snow or during a thunderstorm isn't advisable, but you don't have to wait for perfect weather to hit the links either. When all you need are some weather-ready equipment and some slight adjustments to your game, there's no need to stay housebound.